"Interurbans" redirects here. For the publishing company once known by that name, see Interurban Press. 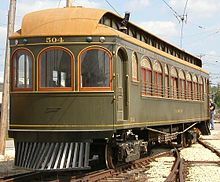 The interurban (or radial railway) is a type of electric railway, with streetcar-like light electric self-propelled railcars which run within and between cities or towns. They were prevalent in North America between 1900 and 1925 and were used primarily for passenger travel between cities and their surrounding suburban and rural communities. Limited examples existed in Europe and Asia. Interurban as a term encompassed the companies, their infrastructure, and the cars that ran on the rails. The interurban, especially in the United States, was a valuable cultural institution. Most roads and town streets were unpaved, and transportation was by horse-drawn carriages and carts. The interurban provided vital transportation links between the city and countryside. In 1915, 15,500 miles (24,900 km) of interurban railways were operating in the United States. For a time, interurban railways were the fifth-largest industry in the United States. A map showing the Detroit United Railway's network in 1904. Interurban routes link street railroads in Detroit, Port Huron, and Windsor. Passenger service as the primary business. Equipment heavier and faster than urban streetcars. Operation on tracks in city streets, and in rural areas on roadside tracks or private right-of-way. The definition of "interurban" is necessarily blurry. Some town streetcar lines evolved into interurban systems by extending streetcar track from town into the countryside to link adjacent towns together, and sometimes by the acquisition of a nearby interurban system. There was a large amount of consolidation of lines following initial construction. Other interurban lines became, effectively, light rail systems with no street running whatsoever, or they became primarily freight-hauling railroads due to a progressive loss of their initial passenger service over the years. In 1905 the United States Census Bureau defined an interurban as "a street railway having more than half its trackage outside municipal limits." It drew a distinction between "interurban" and "suburban" railroads. A suburban system was oriented toward a city center in a single urban area and served commuter traffic. A regular railroad moved riders from one city center to another city center and also moved a substantial amount of freight. The typical interurban similarly served more than one city, but it served a smaller region and made more frequent stops, and it was oriented to passenger rather than freight service. 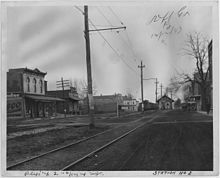 The development of interurbans in the late nineteenth century resulted from the convergence of two trends: improvements in electric traction, and an untapped demand for transportation in rural areas, particularly in the Midwestern United States. The 1880s saw the first successful deployments of electric traction in streetcar systems. Most of these built on the pioneering work of Frank J. Sprague, who developed an improved method for mounting an electric traction motor and using a trolley pole for pickup. Sprague's work led to widespread acceptance of electric traction for streetcar operations and end of horse-drawn trams. The late nineteenth century United States witnessed a boom in agriculture which lasted through the First World War, but transportation in rural areas was inadequate. Conventional steam railroads made limited stops, mostly in towns. These were supplemented by horse and buggies and steamboats, both of which were slow and the latter of which was restricted to navigable rivers. The increased capacity and profitability of the city street railroads offered the possibility of extending them into the countryside to reach new markets, even linking to other towns. The first interurban to emerge in the United States was the Newark and Granville Street Railway in Ohio, which opened in 1889. It was not a major success, but others followed. The development of the automobile was then in its infancy, and to many investors interurbans appeared to be future of local transportation. 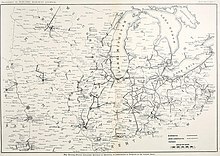 From 1900 to 1916, a large network of interurban lines was constructed in the United States, particularly in the states of Indiana, Ohio, Pennsylvania, Illinois, Iowa, Utah, and California. In 1900, 2,107 miles (3,391 km) of interurban track existed, but by 1916, this had increased to 15,580 miles (25,070 km), a seven-fold expansion. During this expansion, in the regions where they operated, particularly in Ohio and Indiana, "...they almost destroyed the local passenger service of the steam railroad." To show how exceptionally busy the interurbans radiating from Indianapolis were in 1926, the immense Indianapolis Traction Terminal (nine roof covered tracks and loading platforms) scheduled 500 trains in and out daily and moved 7 million passengers that year. At their peak the interurbans were the fifth-largest industry in the United States. The last day of electric operation on the Sacramento Northern Railway, February 1965. At left is the California Zephyr. The fortunes of the industry declined during World War I and particularly into the early 1920s. Many interurbans had been hastily constructed without realistic projections of income and expenses. They were initially financed by issuing stock and selling bonds. The sale of these financial instruments was often local with salesmen going door to door aggressively pushing this new and exciting "it can't fail" form of transportation. But many of those interurbans did fail, and often quickly. They had poor cash flow from the outset and struggled to raise essential further capital. Interurbans were very vulnerable to acts of nature damaging track and bridges, particularly in the Midwestern United States where flooding was common. Receivership was a common fate when the interurban company couldn't pay its payroll and other debts, so state courts took over and allowed continued operation while suspended the company's obligation to pay interest on its bonds. In addition, the interurban honeymoon period with the municipalities of 1895–1910 was over. The large and heavy interurbans, some weighing as much as 65 tons, caused damage to city streets which led to endless disputes over who should bear the repair costs. The rise of automobile traffic in the middle 1920s aggravated those trends. As the interurban companies struggled financially they faced rising competition from cars and trucks on newly paved streets and highways, while municipalities sought to alleviate traffic congestion by removing interurbans from city streets. Some companies exited the passenger business altogether to focus on freight, while others sought to buttress their finances by selling surplus electricity in local communities. Several which attempted exit the rail business altogether ran afoul of state commissions which required that trains remain running "for the public good," even at a loss. Many financially weak interurbans did not survive the 1920s; others went bankrupt during the Great Depression. A few struggling lines tried combining to form much larger systems in an attempt to gain operating efficiency and a broader customer base. This occurred in Ohio in year 1930 with the long Cincinnati & Lake Erie Railroad (C&LE), and in Indiana with the very widespread Indiana Railroad. Both had limited success up to 1937–1938 primarily from growing revenues earned from freight. The 130-mile (210 km) long Sacramento Northern Railway stopped carrying passengers in 1940 but continued hauling freight using heavy electric locomotives into the 1960s. Interurban business increased for the survivors during World War II due to fuel oil rationing and large wartime employment. When the war ended in 1945, riders went back to their automobiles, and most of these lines were finally abandoned. Several systems struggled into the 1950s, including the Baltimore and Annapolis Railroad (passenger service ended 1950), Lehigh Valley Transit Company (1951), West Penn Railways (1952), and the Illinois Terminal Railroad (1958). The West Penn was the largest interurban to operate in the east at 339 miles and had provided Pittsburgh area coal country towns hourly transportation since 1888. Four lines serving commuters in three major cities lasted into the 1960s: the North Shore Line and the South Shore Line in Chicago, the Philadelphia Suburban Transportation Company, and the Long Beach Line in Long Beach and Los Angeles (the last remaining part of the Pacific Electric system). The Long Beach Line was cut in 1961, the North Shore Line in 1963, and the Philadelphia Suburban's route 103 in 1966. The South Shore Line is now owned by the state of Indiana and uses mainline-sized electric multiple units, although one section of street running in Michigan City, Indiana, remains. The Skokie Valley portion of the North Shore Line from Dempster Street to Howard Street was acquired by the Chicago Transit Authority and is now the Yellow Line. The Yellow Line initially operated with third rail from Howard Street to the Skokie Shops and switched to overhead wire for the remainder of the journey to Dempster Street, until 2004 when the overhead wire was replaced with third rail. SEPTA operates three former Philadelphia Suburban lines: the Norristown High Speed Line as an interurban heavy rail line, and Route 101 and 102 as light rail lines. Some former interurban lines retained freight service for up to several decades after the discontinuance of passenger service. Most were converted to diesel operation, although the Sacramento Northern Railway retained electric freight until 1965. Several museums and heritage railways, including the Western Railway Museum and Seashore Trolley Museum, operate restored equipment on former interurban lines. Several former interurban rights of way have been reused for modern light rail lines, including the LACMTA Blue Line and Expo Line and one section of the Baltimore Light Rail. Interurbans typically ran along or on a public right-of-way. In towns, interurbans ran in the street, sharing track with existing street railroads. While street running limited acquisition costs, it also required sharp turns and made interurban operations susceptible to traffic congestion. Unlike conventional railroads, it was rare for an interurban to construct long unencumbered stretches of private right-of-way. [page needed] The torque characteristics of electric operation allowed interurbans to operate on steeper grades than conventional steam locomotives. Compared to conventional steam railroad trackage, interurban rail was light and ballasted lightly, if it all. Most interurbans were built to standard gauge (4 ft 8 1⁄2 in or 1,435 mm), but there were exceptions. Interurbans often used the tracks of existing street railways through city and town streets, and if these street railways were not built to standard, the interurbans had to use the non-standard gauges as well or face the expense of building their own separate trackage through urban areas. Some municipalities deliberately mandated non-standard gauges to prevent freight operations on public streets. In Pennsylvania, many interurbans were constructed using the wide "Pennsylvania trolley gauge" of 5 ft 2 1⁄2 in (1,588 mm). In Los Angeles, the Pacific Electric Railway, using standard 1,435 mm (4 ft 8 1⁄2 in) gauge track, and the Los Angeles Railway, the city's streetcar system, using 3 ft 6 in (1,067 mm) narrow gauge, shared dual-gauge track in downtown Los Angeles with one rail common to each. Most interurban railways in North America were constructed using the same low-voltage 500 to 600 V DC trolley power in use by the street railways to which they connected. This enabled interurban cars to use the same overhead trolley power on town street car tracks with no electrical change on the cars to accommodate a different voltage. However, higher voltage became necessary to reduce power loss on long-distance routes, though substations were established to boost voltage. In 1905 Westinghouse introduced a 6600 V 25 Hz alternating current (AC) system which a number of railroads adopted. This required fewer substations than DC, but came with higher maintenance costs. More common were high-voltage DC systems – usually 1200 V DC, introduced in 1908 by Indianapolis & Louisville Traction Company for their Dixie Flyer and Hosie Flyer services. [not in citation given] In the streets, where high-speed service was not feasible, the cars ran at half speed at 600 V or got a changeover device. A 2400 V DC third-rail system was installed on the Michigan United Railways's Western Division between Kalamazoo and Grand Rapids in 1915, but was abandoned because of the safety hazard. Even 5000 V DC was tested. Most interurban cars and freight locomotives collected current from an overhead trolley wire. The cars contacted this wire through the use of a trolley pole or a pantograph. Others designs collected current from a third rail. Some interurbans used both: in open country, the third rail was used and in town, a trolley pole was raised. An example of this was the Chicago, Aurora, and Elgin Railroad where a trolley pole was used in both Aurora and Elgin, Illinois. Third rail was cheaper to maintain and more conductive, but it was more expensive to construct initially and it did not eliminate the need for AC transformers, AC transmission lines, and AC/DC conversion systems. In addition, third rail posed a serious danger to trespassers and animals and was difficult to keep clear of ice. From 1890 to 1910, roughly, interurban cars were made of wood and often were very large, weighing up to 40 short tons (35.7 long tons; 36.3 t) and measuring as long as 60 feet (18.29 m). These featured the classic arch-window look with truss-rods and cow-catchers. Three of the best known early companies were Jewett, Niles, and Kuhlman, all of Ohio. By 1910, most new interurban cars were constructed of steel, weighing up to 60 short tons (53.6 long tons; 54.4 t). [verification needed] As competition increased in the 1920s interurban companies and manufacturers were attempted to reduce car weight and wind resistance in order to reduce power consumption. The trucks were improved[how?] to provide a better ride, acceleration, and speed but with reduced power consumption. In the 1930s, better quality steel and aluminum reduced weight, and cars were redesigned to ride lower in order to lower wind resistance. Car design peaked in the early 1930s with the Red Devil cars of the Cincinnati and Lake Erie Railroad. In addition to passenger cars, interurban companies acquired freight locomotives and line maintenance equipment. A "box motor" was a powered car exclusive for freight that looked like a passenger interurban without windows and had wide side doors for loading freight. A freight motor was geared for power rather than speed and could pull up to six freight cars depending upon the load and grades. Freight cars for interurbans tended to be smaller than those for steam railroads, and they had to have special extended couplers to prevent car corner contact at the very tight grinding turns at city street corners. Maintenance equipment included "line cars" with roof platforms for the trolley wire repair crew, snow plows and snow sweepers with rotating brushes, a car for weed control and to maintain track and ballast. In order to save money, many companies constructed these in their shops using retired or semi-wrecked passenger cars for the frame and the traction motor mounted trucks. Passenger interurban service grew out of horse-drawn rail cars operating on city streets. As these routes electrified and extended outside of towns interurbans began to compete with steam railroads for intercity traffic. Interurbans offered more frequent service than steam railroads, with headways of up to one hour or even half an hour. Interurbans also made more stops, usually 1 mile (1.6 km) apart. As interurban routes tended to be single-track this led to extensive use of passing sidings. Single interurban cars would operate with a motorman and conductor, although in later years one-man operation was common. In open country, the typical interurban proceeded at 40–45 miles per hour (64–72 km/h). In towns with the middle of the street operation, speeds were slow and dictated by local ordinance. The result was that the average speed of a scheduled trip was low, as much as under 20 miles per hour (32 km/h). Carolina Street was away off at the edge of the little beach city. The end of it ran into a disused inter-urban right of way, beyond which stretched a waste of Japanese truck farms. There were just two house in the last block ... the rails were rusted in a forest of weeds. The Hotel Tremaine was far out of Santa Monica, near the junk yards. An inter-urban right of way split the street in half, and just as I got to the block that would have the number I had looked up, a two-car train came racketing by at forty-five miles an hour, making almost as much noise as a transport plane taking off. I speeded up beside it and passed the block. In E.L. Doctorow's Ragtime, a character rides on interurban systems from New York to Boston. ^ Patch, David (27 May 2007). "Toledo was hub of interurban 100 years ago". Toledo Blade. Archived from the original on 29 April 2015. Retrieved 5 July 2015. ^ Raymond Chandler, Killer in the Rain, Penguin 1964, p. 67-68. Originally published in Black Mask in March 1936. Bruce, Alfred W. (1952). The Steam Locomotive in America. New York: Bonanza Books. OCLC 1197341. Bradley, George K. (1991). Indiana Railroad: The Magic Interurban. Chicago: Central Electric Railfans' Association. ISBN 0-9153-4828-4. OCLC 24942447. Bureau of the Census (1905). Street and Electric Railways, 1902: Special Reports. Washington, D.C.: GPO. OCLC 6024669. Grant, H. Roger (Spring 1980). "Arkansas's "Paper Interurbans"". The Arkansas Historical Quarterly. 39 (1). JSTOR 40023151. Grant, H. Roger (2016). Electric Interurbans and the American People. Bloomington, Indiana: Indiana University Press. ISBN 978-0-253-02272-1. Hilton, George W.; Due, John Fitzgerald (1960). The Electric Interurban Railways in America. Stanford, CA: Stanford University Press. ISBN 978-0-8047-4014-2. OCLC 237973. Jensen, Oliver (1993). American Heritage History of Railroads in America. New York: Bonanza Books. ISBN 9780517362365. OCLC 27976092. Keenan, Jack (2001). "The Fight for Survival: the C&LE and the Great Depression" (PDF). Indiana Historical Society. Middleton, William D. (1961). The Interurban Era. Milwaukee, WI: Kalmbach Publishing. ISBN 978-0-89024-003-8. OCLC 4357897. Rowsome, Frank M.; Maguire, Stephen D. (1956). Trolley Car Treasury. New York: Bonanza Books. OCLC 578061777. Brough, Lawrence A.; Grabener, James H. (2004). From Small Town To Downtown: A History of the Jewett Car Company, 1893-1919. Bloomington, IN: Indiana University Press. ISBN 0-253-34369-0. Demoro, Harre W. California's Electric Railways: An Illustrated Review. Glendale, CA: Interurban Press. ISBN 091-6374-742. Due, John F. (1966). The Intercity Electric Railway Industry in Canada. Toronto: University of Toronto Press. OCLC 238045. Harwood, Herbert H.; Korach, Robert S. (2000). Lake Shore Electric Railway Story. Bloomington, IN: Indiana University Press. ISBN 0-253-33797-6. Keenan, Jack (1974). Cincinnati & Lake Erie Railroad: Ohio's Great Interurban System. San Marino, CA: Golden West Books. ISBN 0-8709-5055-X. Kulp, Randolph L. (1966). History of Lehigh Valley Transit Company. Allentown, PA: Lehigh Valley Chapter, National Railway Historical Society. OCLC 4649131. Marlette, Jerry (1980) . Electric Railroads of Indiana. Indianapolis: Hoosier Heritage Press. OCLC 7364454. Meyers, Allen; Spivak, Joel (2004). Philadelphia Trolleys. Images of rail. Charleston, SC: Arcadia Publishing. ISBN 0-7385-1226-5. Middleton, William D. (2009). Frank Julian Sprague: Electrical Inventor & Engineer. Bloomington, IN: Indiana University Press. ISBN 0-253-35383-1. Schramm, Jack E.; Henning, William H.; Andrews, Richard R. (1988–1994). When Eastern Michigan Rode the Rails. Glendale, CA: Interurban Press. ISBN 0-91637-465-3. Springirth, Kenneth C. (2007). Suburban Philadelphia Trolleys. Charleston, SC: Arcadia Publishing. ISBN 978-0-7385-5043-5. Trimble, Paul C. (2005). Sacramento Northern Railway. Images of rail. Charleston, SC: Arcadia Publishing. ISBN 073-8530-522. This page was last edited on 2 April 2019, at 15:08 (UTC).